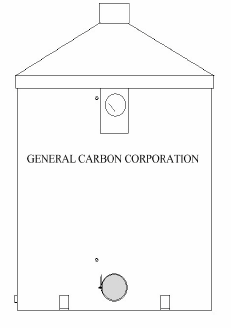 Activated Carbon Filtration | ES-Series | General Carbon Corp.
General Carbon’s ES-Series provides a simple, cost effective solution for odor control problems and air treatment. The adsorber is constructed of HDPE for corrosion, weather resistance and durability. All fittings are welded to the tank and vessels up to 50 inches have removable tops for easy service. Larger vessels have a 20 inch man way for access. Available Options – We offer a complete selection of NEMA rated motors and controls that are prewired and skid mounted. All fans are ordered to your flow rate and static pressure requirements. Additional options include Hydrogen Sulfide monitor, custom instrumentation including alarms, warning devices, explosion proof components, carbon sample ports, FRP fans, FRP equipment skid, exhaust stack and rain hood. General Carbon Corporation can recommend and provide special impregnated carbons to enhance control of problem chemicals. When the media needs replacing we will be glad to provide a service quote. We maintain our own fleet of modern equipment and trained technicians that are able to complete any change-out service quickly and safely. Please call for a price quote. Wet activated carbon removes oxygen from air causing a severe hazard to workers inside the carbon vessels. Confined space/low oxygen procedures should be put in place before any entry is made. Such procedures should comply with all applicable Local, State and Federal guidelines.